Meeting Andrew Wilkinson can be intimidating. 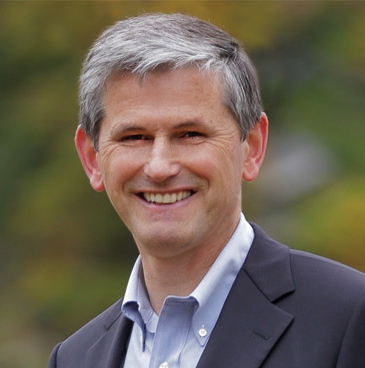 The BC Liberals candidate for Vancouver-Quilchena is a tall man in his early fifties, looking like a self-confident leader in spite of his boyish freckles. Moreover, Wilkinson is a political heavyweight, a former deputy minister and party president. Oh, and did I mention he is also a medical doctor and a lawyer? On the podium, Wilkinson is a polite gentleman and eloquent speaker. And he is competitive. “Can we turn up the lights?” is the first thing Wilkinson says when the all-candidates debate at Magee Secondary School begins. He wants to see the audience, a theatre of over 500 high school students, and interact with them. And thus, Wilkinson sets the tone of the debate before it even starts. From now on, the crown prince of Quilchena (the Liberals won 70 per cent of the votes in 2009) will always be the first to answer questions, and will often get the longest response time. Wilkinson, who brought his son along to Magee, repeatedly tells the students how the BC Liberals have created 33,000 new apprentice spaces and have generally made post-secondary education more accessible. He urges the students to listen to their teachers. “Opportunity has to come from training. It’s not easy to anticipate skills of the future,” he says. 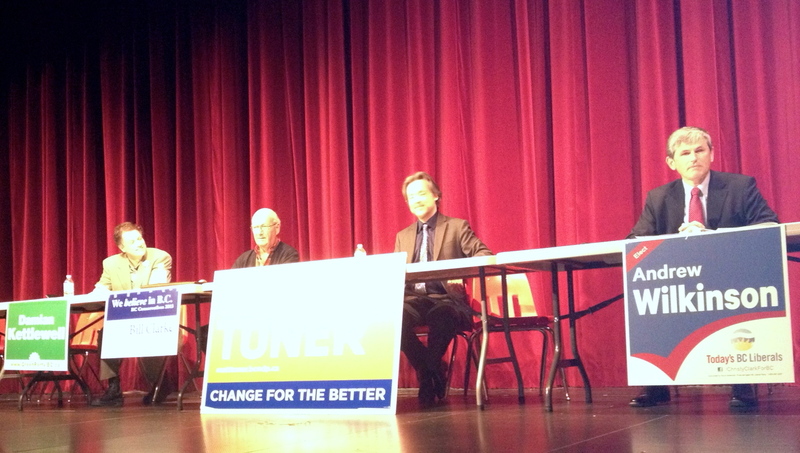 The candidates on stage at Magee Secondary on April 30, 2013. After explaining to the students what fracking actually is (the process of extracting natural gas from shale rock layers by injecting highly pressurized fluids into the shale area), he tells them that since the 1950s, 3,000 wells were fracked in B.C. without any ground water contamination. Only Green candidate Damian Kettlewell, who expresses concern about the use of chemicals and the waste of water during the procedure, objects this proposition. After the Magee debate, Wilkinson has another appointment, so we rush through the interview and talk about what he thinks of the polls that predict the NDP is on a winning spree. Why should people with environmental concerns vote for him instead of Nicholas Scapillati of the NDP, who has a strong environmental background? Vancouver-Quilchena has meanwhile a Conservative candidate, Bill Clarke, a four-time MP. Does he pose as an obstacle? 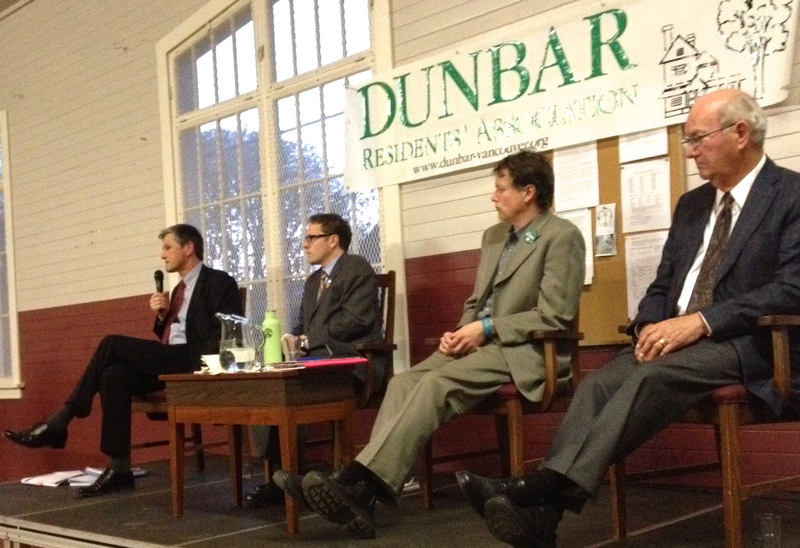 The all-candidates debate in Dunbar featured (from left): Andrew Wilkinson, Nicholas Scapillati, Damian Kettlewell and Bill Clarke. In the evening, Wilkinson is on stage at the Dunbar Residents Association’s all-candidates debate in Dunbar. The structure of the event is more a Q&A line up than an actual debate. Wilkinson’s statements are similar to the ones at Magee. But then something unexpected happens. When a resident asks how a new B.C. government would take care of children with special needs, Wilkinson suddenly chokes. His voice breaks, and for seconds, an awkward silence comes over the room. “This issue is dear to my heart,” says Wilkinson, almost in tears, because he has a younger sister with special needs. He does not elaborate further, but goes on to speak about his experience as a family doctor. Maybe he will reveal more when he speaks at an all-party forum on mental health and addictions on May 7. If the performance of the candidates at the debates is any indication, Wilkinson will not win Quilchena without a battle. NDP candidate Scapillati is passionate about being the liaison between the riding and Victoria. The environmentalist also has an interest in First Nations issues and strong ties to the Musqueam band. Damian Kettlewell, a third-time contender, is adamant a historic victory for the BC Green Party is pending. Bill Clarke thinks the fact his party now has a conservative candidate in the riding will provide voters who are fed up with the present government a legit alternative. Finally I revisit the short questions I asked all candidates, which Wilkinson, in a rush to his car, only answers briefly. -Name a good thing the current B.C. government has done the last 12 years. -Name a good thing the City of Vancouver has done in the last years. -What is your main means of transportation? -What do you think of Christy Clark’s red light issue? -As former president of BC Civil Liberties Association: What is your opinion about euthanasia/assisted suicide? -Name me some B.C. movies you have seen in the last year. We get to the CBC news vote compass questions, which he generally does not want to answer with a simple yes or no. “I already answered that in there.” In fact, Wilkinson did not answer the question directly, but referred to arguments made by one of his wife’s relatives, a police officer in Washington State. -Should immigrants adopt Canadian values? (Lib: somewhat agree). Wilkinson does not answer directly, but refers to Christy Clark’s five criteria for the Northern Gateway project. This entry was posted in Dunbar, Issues & Ideas, Kerrisdale, Musqueam, Politics, Vancouver and tagged an emotional politician, Andrew Wilkinson, assisted suicide, B.C. Film, BC elections 2013, BC Liberals, BC politics, Bill Clarke, Damian Kettlewell, Dunbar resident association, fracking, Katja De Bock, legalizing marijuana in BC, Magee Secondary School, Matt Toner, Nicholas Scapillati, pot legalization, Vancouver-Quilchena, young voters by westsidebeat. Bookmark the permalink. Did we get a clear answer yet? as Wilkinson was in a rush when I interviewed him, I tried to reach him several times in the weeks before and after his election. I emailed him to both the addresses on his business card and the official campaign page email address. I phoned the campaign office twice. I spoke with the campaign manager and emailed that person my questions, as well. Yet no reply from Wilkinson. If you get hold of him, please let me know what he personally thinks, because I could not find out!